Controlling a quick, powerful drone is a blast, especially if you can use the drone to catch some great action footage with a GoPro camera. To help you find the best drones for GoPro at affordable prices, we’ve researched a number of new and best selling products. Before we jump into our reviews of the top ten drones that use GoPro, here are some features you need to know when shopping. What’s the secret to choosing the best drone for GoPro? Camera: When comparing options, you’ll want to note whether or not your drone comes with a camera. We’ve made it easy by including this info along with every GoPro drone review. Other helpful camera specs will be included in the details. Range: How far can you let a drone fly without losing control? You don’t want to chance losing your new toy. We’ll let you know how many hundreds or thousands of feet you can let it zoom while maintaining complete control. 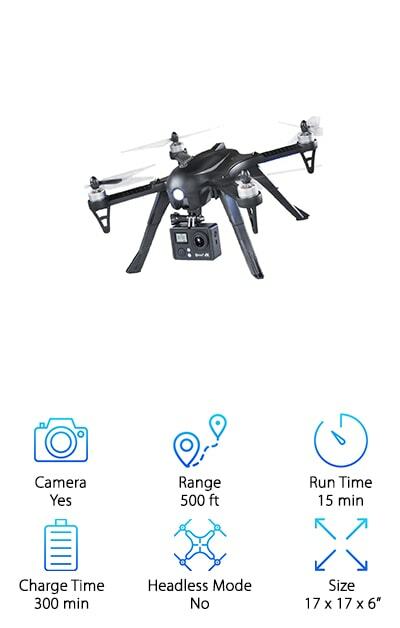 Run Time: The length of time a drone can stay in the air depends on several factors, including the type of motor it has and the weight it carries. For maximum enjoyment, you’ll need to know what to expect from each machine. Charging Time: This spec gives you an idea of how long you’ll have to wait for a battery charge between flights. Not in the mood to wait? For longer running time, you may wish to purchase extra batteries and swap them out. Headless Mode: A drone in headless mode is directed relative to your position rather than its own. For example, when you push forward, it will go straight before you regardless of the direction it faces. This is especially helpful when flying distances. Size: Finally, you’ll want to know how large a drone is before you consider purchasing it. After all, this will affect how you’re able to use the product. For your convenience, this spec is included in each of the reviews below. Now: You’re ready to choose the best cheap drone for GoPro and begin the adventure. If you’re in a hurry to get started, take a look at our top pick and budget pick. Among the ten great options reviewed below, these are two solid favorites. Here’s the deal: both offer a sharp all-around experience at an affordable price. If you’re curious about further options, like smartphone drones and the best drone for travel, we’ve covered those too. So let’s fly. The Force 1 Ghost Drone is another powerful option that is a great choice for both beginners and experts. A brushless motor gives the Ghost its extra smooth, quiet flight for better photo and video quality. 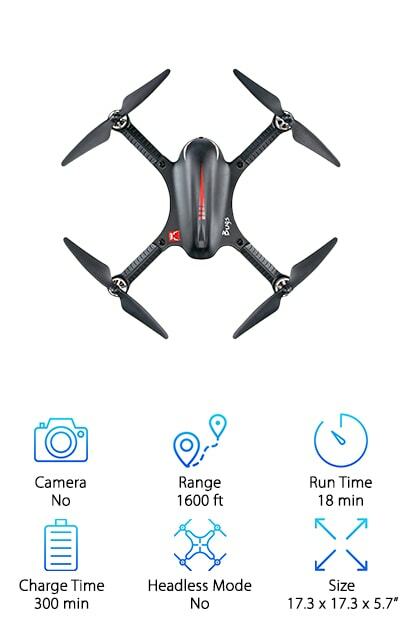 This drone comes with a 1080p HD camera that is designed with optimal balance in mind and is detachable. You'll be able to catch crisp and brilliant birds-eye photos and videos while enjoying smooth, responsive flight. The Ghost has an incredibly long flying time of around 15 minutes and comes with an extra battery, so you can fly for long stretches of time. Controlling it is also luxuriously easy. Flips and other stunts are sharply executed, and the drone continues to respond from distances well over 1000 feet. You even have the option of setting the speed to low or high for optimum versatility as you learn or experiment with new moves. Bottom line: This is a sweet buy that offers hours of cool. This GoPro-ready quadcopter is a strong, budget-friendly choice, especially if you’re looking start out with some test runs on a cheap drone for GoPro. An extremely versatile and affordable flyer, the Ionic Stratus is the first gyro-based drone available with a GoPro attachment. 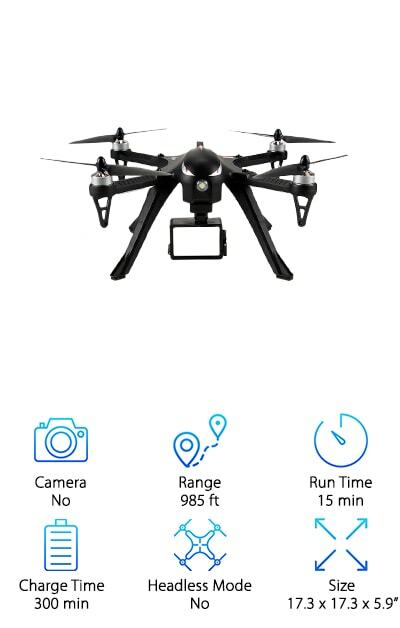 Its six-axis gyro system is solid and steady, so you’ll be able to catch some impressive footage from almost impossibly high altitudes. And check this out. Your GoPro is protected on this drone by a shock-absorbing cradle head, so you save on flinches if your landings are still a bit shaky. The fact that this quadcopter is one of your most inexpensive options doesn’t mean it doesn’t include plenty of crazy fun features. It has great lift and speed to spare. You also have the option of switching it into headless mode, which orients the drone to your position, making it easier to direct. The controls are simple to master and even feature a 1-button 3D roll. 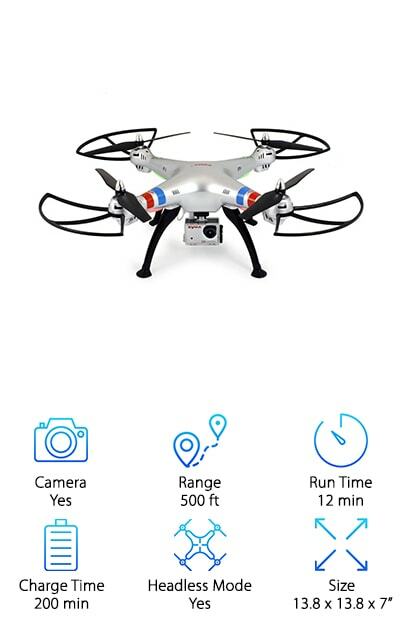 Capture spectacular images from above with the Contixo Photography Drone. This incredibly powerful bird carries a detachable 4k Ultra HD camera that can take brilliantly clear photos and videos. It also works with a variety of GoPro accessories. With a Wifi signal to 30 feet, you can even connect it to your smartphone for live streaming. An excellent, all-around drone, the Contixo is notable for its power and versatility. Its sensitive controls allow you to coast gently while capturing footage or send it ripping along like a racer. This drone has a high-capacity battery and impressive signal range. If voltage does get low or the signal becomes weak, the drone's remote control will beep warning you to bring it down. 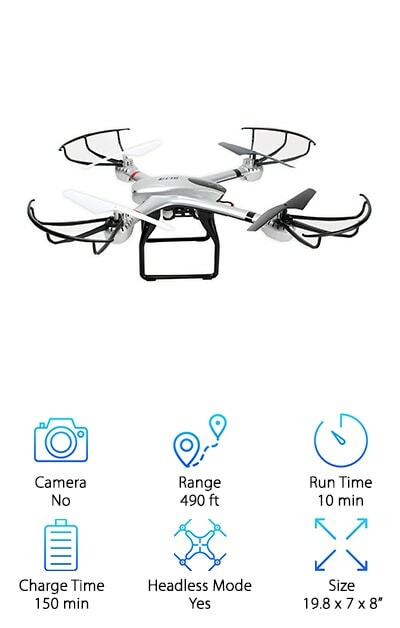 Think about it: equipped with LED lights for night flying, a powerful brushless motor, extra batteries, ultra HD capabilities, and a sturdy aluminum carrying case, this is an excellent drone and camera combo—the real deal that feels like a steal. The Goolsky MJX Drone functions on a 6-axis gyro system. This makes it sensitive to your regulation, stable in the air, and beautifully flexible. This is also another drone that features a brushless motor. You may be wondering, is a brushless motor that big of a deal? Well, yeah, it is. With this efficient, low-stress motor, you’re getting about 50% more of everything out of your drone: Longer battery life, smoother and quieter flying, better durability, and extended flight time. The Goolsky drone also features Independent ESC for safer, worry-free flying. Attach the GoPro action camera of your choice, and you’re ready to start recording footage from the sky. One last thing. We have to highlight the high-capacity battery, which is easily removable and runs for up to 18 minutes. This is an incredibly long running time for a low-cost drone. For power, agility, speed, and affordability all in one smart package, you won’t get much better than this flyer. If you're ready for a step-up drone, but don't want to shell out all your savings, the RCtown Brushless Drone is an excellent choice. This powerful drone is a racehorse, which makes it a handful for the beginner and a delight for the expert. Super sensitive to control, this drone takes off with a fast launch and is responsive from over 1000 feet away. Its durable, slightly heavier build means it can take a bit more wind than most drones. Plug your GoPro action camera into the built-in camera slot and the RCtown drone is ready to begin shooting gorgeous, steady video. What do we love most about this drone? The quality. The RCtown Brushless drone is a well-made machine with a powerful, efficient motor that supports lengthy flying times at long range. This is an above-average flyer at a below-budget price. 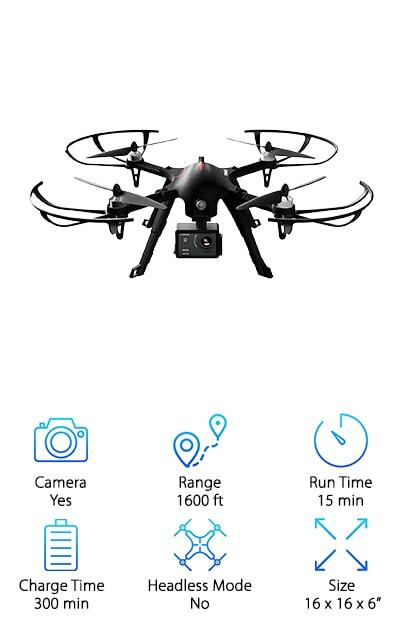 For a powerful, controllable drone that is easy on the pocket, you can’t get much better than this. For ultimate control, the Modin Quadcopter Drone allows you to choose either high speed or low-speed mode by simply flipping a switch. A built-in camera mount makes it easy to plug in your GoPro action camera before sending the drone cruising or zipping through the air. 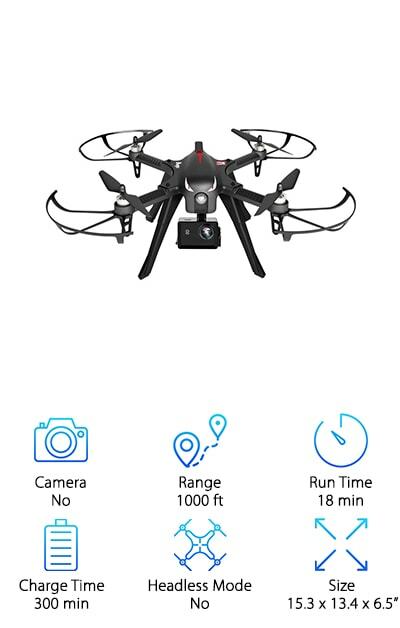 Capture effortless HD videos and have tons of fun with this powerful, affordable drone. This drone can sweep out over 1000 feet away while you remain completely in control. The energy-efficient, high-quality brushless motor will give you many minutes of flying, and the remote has a smart alarm that will sound when the battery starts to give out or your drone reaches the edge of its impressive signal range. A built-in Independent ESC means you won’t have to worry about your drone overheating. Brilliant LED lights mean you can enjoy flying your drone and shooting video even at night. And check this out: this durable drone integrates a reinforced frame for unprecedented resilience. This is a nice, big quadcopter, and a great beginner drone. The 6-axis gyro system keeps the drone steady in the air and is flexible and responsive to control. Learning to steer, hover and dive without the extended technology of higher-priced models will pay off in confidence and ability as a drone player. This is a sturdy model that will hold up well to a few light crashes and rough landings. Now: don’t think this is only a toy you’ll soon outgrow. Let’s take a look at some of this drone’s finer features. A one-button 360-degree roll will get you started on some pretty wonderful stunts, and the Syma Quadcopter will give you great action and smooth performance. It comes with a decent 8 MP HD camera, which is easy to attach or remove, so you can start shooting video right away. The camera slot will also support a GoPro action camera when you’re ready to step up your shots. 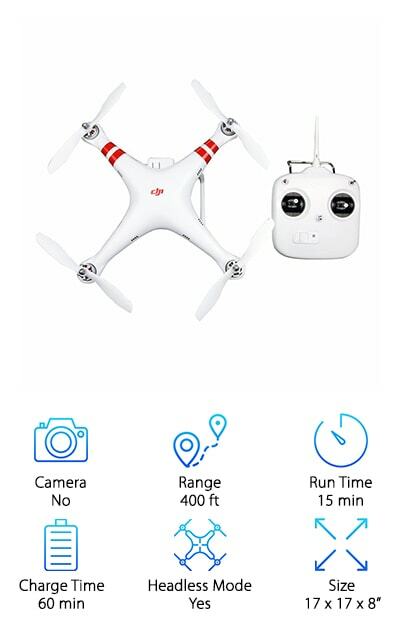 The DJI Phantom Aerial Drone is a favorite among beginners and pros for its advanced features and ease of use. A simple, sleek design includes a mount for your GoPro action camera and is perfect for photographers or film-makers seeking new points of view, drone hobbyists looking to record their stunts, or sports enthusiasts filming a fast-paced game from above. One of the Phantom’s amazing features is an advanced GPS positioning system that is able to compensate for slight winds during flight. It also contains an automatic navigator that will bring the drone home should it fly out of your maximum control range. Turn on the Naza-M autopilot, and the drone will steer relative to a home point, regardless of its position. 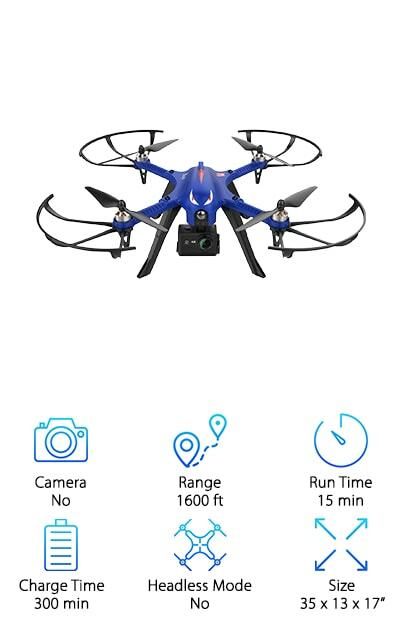 With a top horizontal speed of 22 miles per hour, this drone should be able to keep up with any kind of action, and its propellers are designed for smooth, even flight that supports splendid video quality. The DROCON Bugs Drone, affectionately known as the Bugs 3, is pretty much a dream machine. First of all, it has a brushless motor. This means you won’t have to worry about overheating, fraying or sparking as you would with a regular brush motor. Enjoy longer flying time with this efficient motor and powerful battery combination. And check this out. The DROCON Bugs Drone is incredibly swift and agile. If you’re already a drone expert, you’ll be wowed by the flips, dives and other maneuvers you can get out of this machine. The Bugs 3 is also a great drone for beginners. Unique two-way communication makes it very responsive and controllable even at 1000 + feet away. And it’s one of the most stable drones available. Plug your GoPro action camera into the built-in camera slot on this little beauty, and you’ll be all set to capture smooth and gorgeous video. 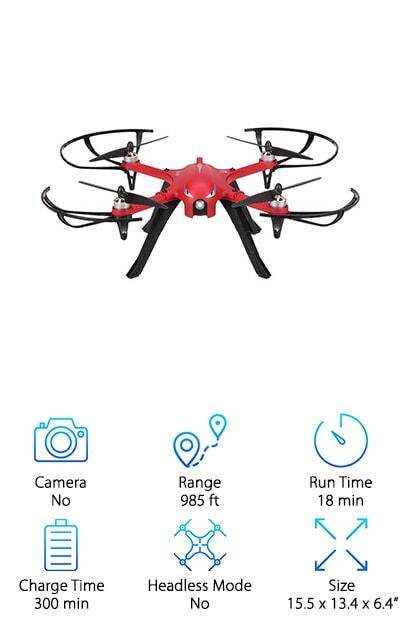 This is an amazing drone at an amazing price. Here’s the scoop on the Tokky RC Drone: This cool quadcopter is built for speed. You can choose to run it in either beginner mode or advanced mode, but be prepared. In either mode, this drone has a terrific amount of zip. Thankfully, it’s also very responsive to the controls and has a few safety features that will save you unnecessary breakage and loss. If the drone is nearing the limit of its signal range, or if the battery is low, the remote will warn you with a beep so you can maintain control. The GoPro camera mount is also equipped with a shock absorber in lieu of unavoidable bumps or tumbles. A waterproof carrying case is also included. The efficient brushless motor gives this drone a 50% longer battery life than drones with regular motors. And here’s the best part: the Tokky RC Drone is equipped with super-bright LED lights so you can try out some amazing night flying.